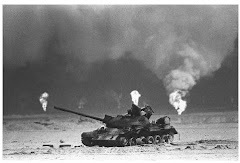 PHOTO: Iraqi tanks invade Kuwait, August 2, 1990. (91outcomes.com) – Twenty years ago today, Iraq invaded its neighbor Kuwait over an oil dispute, paving the way for a U.S.-led international military coalition to expel Iraq from Kuwait and for two more decades of war in the region. In all, 696,842 U.S. troops served in the war, which was to begin five and a half months later on January 17, 1991 after months of diplomatic positioning, marking the beginning of Operation Desert Storm. While Coalition war causalities “only” numbered in the hundreds – small numbers for a war, even a six-week war like the 1991 Gulf War, the lasting damage remains untold. Of course, the Iraqi casualties were far, far higher – some estimates have ranged as high as 100,000 of more. And, countless Kuwaiti military and civilians were killed during the Iraqi invasion and subsequent, nearly seven-month occupation. In an April 2010 scientific review, the Institute of Medicine, part of the U.S. National Academy of Sciences, found that 250,000 veterans of the 1991 Gulf War continue to suffer from debilitating, chronic multi-symptom illness. 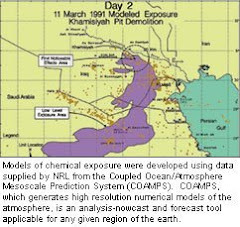 While some have sought a “lone”, “unique” cause, the only real medical mystery following the Gulf War’s environmental toxic soup is why that every military service member didn’t become sick and disabled. Today, more than one-third of our veterans of the 1991 Gulf War remain chemically wounded and disabled from their military service. Yet, there are no effective treatments for the resulting conditions brought on by overlapping toxic exposures that lead to an overlapping complex of multi-system symptoms that in their totality range from significantly to totally disabling. But hope is genuinely and finally the mood of the day after last week’s Congressional hearing on Gulf War illness issues showed all parties aligned – Congress, VA, scientists, advisory committee leaders, veterans’ organizations, veterans – toward a common cause: pushing scientific research to genuinely improve Gulf War veterans’ health and lives. Congressional, VA, and veterans’ organization leaders have never been in such agreement as was seen in last week’s hearing, notwithstanding the justified frustration expressed by the veterans who provided testimony to the Congressional oversight committee, noting the years of official denial and only limited, fragmented progress. Twenty years is clearly far too long to wait for appropriate healthcare to alleviate combat injuries. But, better late than never – and Godspeed to Gulf War veterans’ allies in VA and Congress.